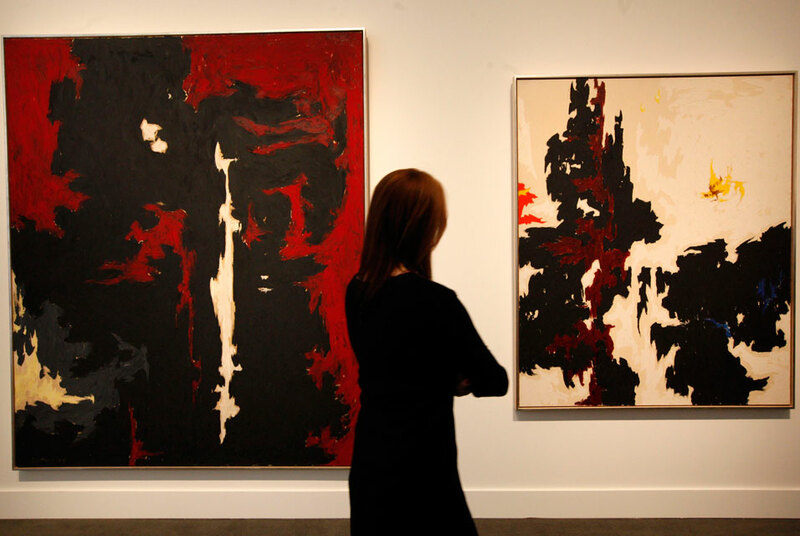 A woman looks at '1949-A-No.1' (L) and '1947-Y-No.2' by Clyfford Still on display at Sotheby's. REUTERS/Brendan McDermid. NEW YORK, NY.- A group of four paintings by the celebrated American Abstract Expressionist Clyfford Still have just sold for a combined total of $114.1 million (est. $51/71.5 million) in Sothebys sale of Contemporary Art in New York. The group was led by the exquisite and profoundly important 1949-A-No. 1 - one of the greatest examples of 20th century American painting - which was sought after by five bidders before fetching $61,682,500, more than double the previous record for the artist at auction (est. $25/35 million). This was immediately followed by 1947-Y-No. 2, which sold for $31,442,500, well above the pre-sale estimate of $15/20 million, and (PH-1033), from 1976, which brought $19,682,500 (est. $10/15 million). The group ended with the early work from 1940, (PH-351), that sold for $1,258,500 (est. $1/1.5 million). All of the works came from the Estate of Patricia Still and were being sold by the City and County of Denver to further support the endowment of the new Clyfford Still Museum, which is scheduled to open to the public in Denver on 18 November 2011. As a group they represented a complete historical retrospective of the artists repertoire. The presentation of these four works at public auction followed a private sale period, where these works were first offered to museums for purchase. Considered to be one of the most important artists of the 20th century, Clyfford Still (1904-1980) was among the first generation of American Abstract Expressionists who developed a new, powerful approach to painting in the years immediately following World War II. Still was independent, bold, incisively intelligent and utterly influential. He was a monumental figure of unwavering commitment to creative originality and aesthetic freedom. He approached each canvas with formidable purpose and a deep desire to express the inexpressible. Each stroke, each nuance of surface, each color is assiduously applied as a compelling means of self-expression. Stills oeuvre is crucial to the birth of Abstract Expressionism, and integral to the development of many fellow giants such as Mark Rothko and Barnett Newman, yet he intentionally belonged to no one genre of art. For Still, painting was a unique and singular totality that could speak to the soul and address universal themes of life, death, freedom and oppression that were the very essence of philosophical discourse in the post-war era at mid-century. In the summer of 1943, Still met Mark Rothko in Berkeley and for a time, the two artists forged a close and mutually productive relationship. In Fall 1943, Rothko joined Peggy Guggenheims ground-breaking New York gallery, Art of This Century (1942-1947), which championed European avant-garde artists and, more importantly, launched the early careers of American post-war artists who would become giants. During Stills yearlong visit to New York in 1945-46, Rothko introduced him to Guggenheim who organized Stills first New York exhibition, held in February/March 1946, and Rothko wrote the introduction to the show, which included the 1940 painting (PH-351). Acquisitions of Stills work were primarily restricted to sales through Betty Parsons, Sidney Janis and Peggy Guggenheim. In 1951 the artist moved to New York City but in the mid-1950s he broke ties with commercial galleries and restricted loans to museum exhibitions in which he acted as consultant on curatorial and installation decisions. After he moved to Maryland in 1961, Still continued to refine and distill his compositions with mature confidence, encouraged by his spacious studio in a converted barn on his 22 acre farm. Since clyfford stills death in 1980 the painters oeuvre has remained somewhat enigmatic as his estate was removed from the public domain. This insightful selection of four paintings presents the full spectrum of the artists career that represents a complete historical retrospective of Stills repertoire. From his earliest exploration into Surrealist-tinged abstraction of the late 1930s / early 1940s to the majesty of the later paintings of the 1970s, each seminal stage in his inspiring career is represented with a work of quality and critical importance. The years from summer 1946 to 1950 were Stills most triumphant period in which he elaborated his vision on an even larger scale with paintings such as the exquisite and profoundly important oil on canvas 1949-A-No. 1, measuring 93 by 79 inches. In this painting, which was chosen for the cover of the 1979-1980 retrospective at the Metropolitan Museum of Art, Stills unfettered display of color within a holistic union of form, space and line achieved his desire to transform art into a force of nature. In late 1946, Still had returned to San Francisco to begin an influential four-year period as a teacher at the California School of Fine Arts, but he maintained a dialogue with his New York counterparts and continued to exhibit on both coasts. From 1947 to 1951 Still showed with Betty Parsons, New Yorks most significant dealer once Peggy Guggenheim closed her gallery in 1947. During visits to New York at this time, Still and Rothko originated the idea of founding a school to foster original and avant-garde artists, which eventually became The Subjects of the Artists under the aegis of Rothko, Barnett Newman and Robert Motherwell after Still withdrew from the project. 1949-A-No. 1, with its fiery reds and velvety blacks, jagged passages and textured strokes, was included in the 1959 retrospective organized at the Albright (now AlbrightKnox) Art Gallery. The quintessential painterly abstract style exhibited in 1949-A-No. 1 is equally evident in 1947-Y-No. 2, which was executed in 1947 and measures 69.5 by 59 inches, in which the human gesture was the sole signifier of the human presence in Stills art. Together these two paintings represent an achievement that set a new precedent in American art and occurred following a period of heightened dialogue between Still and his fellow East Coast artists. In paintings such as Stills oil on canvas (PH-1033), which measures 93.5 by 83 inches and was painted in 1976, he created an expansive masterpiece of grand sweep coupled with nuanced surface in which accumulated and interwoven strokes of intense color overwhelm the viewer. Along with 1949-A-No. 1, (PH-1033) was chosen for the major 1979-1980 retrospective of Stills work organized with the Metropolitan Museum of Art, just prior to his death in June 1980. Executed in 1940, his oil painting (PH-351), is the earliest work in this group and it was painted while clyfford still was an assistant professor of art at Washington State College in Pullman. The canvas, which is estimated at $1-1.5 million, eloquently demonstrates the degree to which Still had already developed an innovative style that championed primal forms as inspiration and abandoned the human figure and traditional subject matter. In 1941, Still left his home state of Washington and moved to California, his primary home from 1941-1943 and 1946 to 1950, along with a teaching assignment in Virginia from 1943-1945. His innovations in abstracted form and color predate the emergence of New York Abstract Expressionism and his importance as the premier Abstract Expressionist artist on the West Coast was signaled by his first one man retrospective at the San Francisco Museum of Modern Art in March 1943, which included (PH-351).